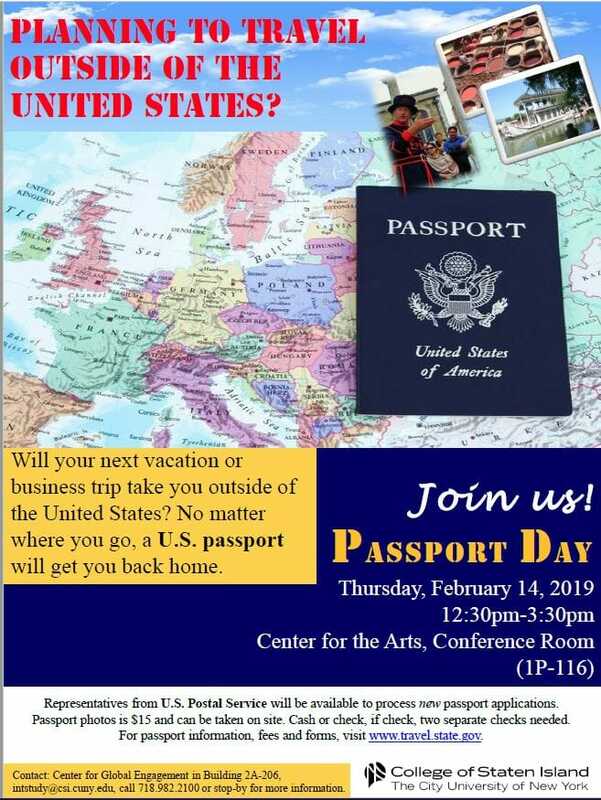 Members of the CSI community can apply for a U.S. Passport on Passport Day, Thursday, Feb. 14 in the Center for Arts Conference Room (Building 1P, Room 116) from 12:30pm to 3:30pm. Obtaining a passport is the first step to a life-changing international experience. Apply for your first passport right here on campus. This special service is offered to CSI community. Please tell your students and share with your friends at CSI. A flyer is online. Representatives from U.S. Postal Service will be available to process new passport applications only. Passport photos ares $15 and can be taken on site. Cash or checks will be accepted only; if check, two separate checks are needed. Contact the Center for Global Engagement if you have any questions via email at intstudy@csi.cuny.edu or call us at 718.982.2100. Avoid the long lines at the Post Office and New York Passport Agency. Don’t let this convenient opportunity pass you by.